Welcome back! It has been a while since we blogged last, and we have missed our loyal followers, but we are back and ready to blog. For those who are joining us for the first time, the intent of ECAD's blog is to be; (1) Informative, (2) Supportive, (3) Resourceful, as well as provide awareness to all. We have compiled a list of topics that we would like to cover throughout the year, however, your feedback and suggestions are encouraged! With the formalities done, let's introduce the faces behind the text. 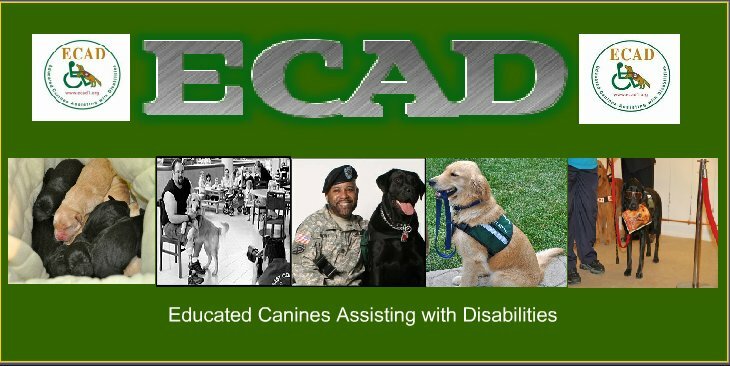 Lee is a retired police officer, an advocate, and a client of ECAD. Lee is the proud owner of Brady, a 2 year old male golden retriever, who has proudly been serving her since 2011. Lee will be maintaining the blog and the information posted along side of Carrie. Carrie works in Fund Development, Marketing & HR as well as maintaining social media. Together we will keep the blog moving, monitoring that is remains positive, and stays focused on the initial intent. Glad to learn more about these adorable puppies whose future will make a big difference to many people.